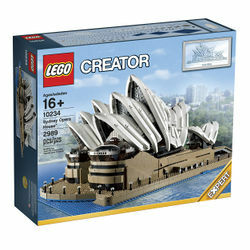 10234 Sydney Opera House is a Creator Expert set released on September 1 2013. It contains 2989 pieces. The Sydney Opera House is a building located in Sydney, Australia by the docks and is used for opera shows and other performances. This is a description taken from LEGO.com. Please do not modify it. Recreate Australia's architectural masterpiece! Recreate one of the 20th century's most distinctive buildings with the Sydney Opera House model. Build the unmistakable shell roofline, waterfront forecourt and more with this authentic representation of Australia's most iconic building. Employ a variety of new and advanced building techniques to recreate the complex forms, angled walls and subtle detailing of the real thing! Collect lots of dark tan LEGO bricks including the rare 1x1x2/3 stud and 1x2x2/3 stud slopes, as well as a 48x48 stud baseplate in blue for the very first time! Build this model of a UNESCO World Heritage Site! Includes hard-to-find dark tan LEGO bricks, tiles and sloped bricks! Collect the 48x48 stud baseplate, available in blue for the very first time! Sturdy construction allows the model to be handled and moved! Features advanced building techniques for complex forms, angled walls and subtle detailing! Measures over 11" high, 25" wide and 15" deep! Facts about "10234 Sydney Opera House"
This page was last edited on 9 January 2016, at 00:39.